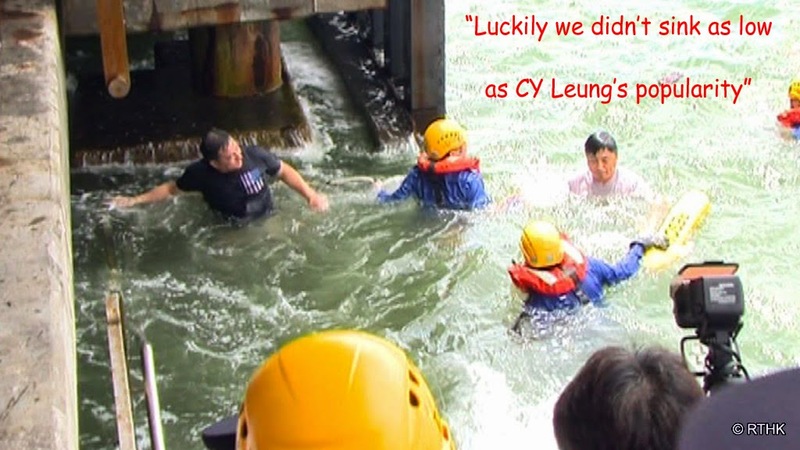 Four anti-Occupy Central protesters jumped into Victoria Harbour yesterday. Meanwhile another group of antis, the Hong Kong Island Commercial Alliance, staged a drive-by protest yesterday, apparently being too lazy to walk. I'll be out with a lot of other people walking from Victoria Park to Tamar tomorrow - see you there. Interesting choice of phrase there, considering there are suggestions in some circles that the North East New Territories development, as it's officially called, may in reality be less about Fanling North than Shenzhen South. Paranoia? See here also, then you decide. Satire - Who Needs it? 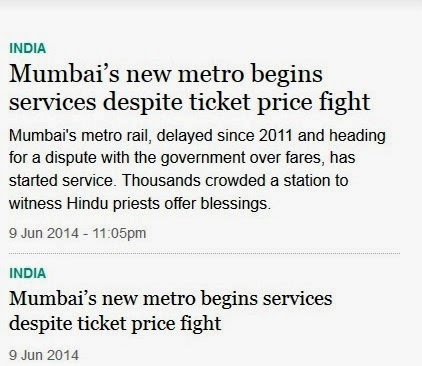 "In other news..." is a standard satirical device for ridiculing absurd official statements. In most countries, this means producing a humorously exaggerated version of other public statements. 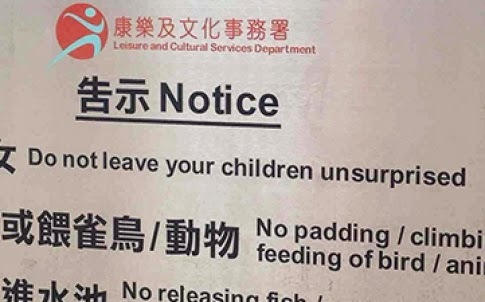 Here in Hong Kong, there is no need to do that - what the authorities say is already absurd enough to be a satire of itself. 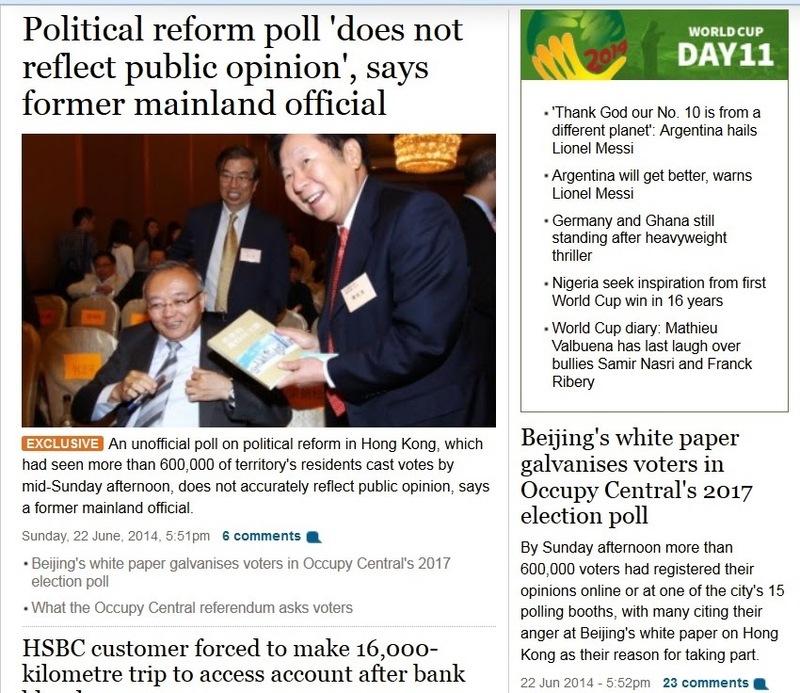 Typically absurd Pro-China Morning Post front page above, as well - giving the opinion of one clapped-out retired Chinese politician greater prominence than the opinions of more than half a million Hong Kongers. It is obvious from the postings on the Chrome forum that I am far from the only user annoyed by this policy. If Google want to flag extensions as potentially dangerous to alert the user, that's fine. But what gives them the right to decide what software the user can add to his system, and to irretrievably disable anything they don't like? Oh well, back to Firefox. Realdownloader works fine with that. In response to my last post, Troika says "Funny how the SCuMP never draws attention to its own gaffes". I suggest the reason is that they don't even notice them. Certainly yesterday's web page, where the same headline appeared twice, suggests that no one is actually editing (or even reading) their output. However, I rather like the comment from one person interviewed by the Post that the mistake doesn't matter much because "few people pay attention to the warning signs anyway". 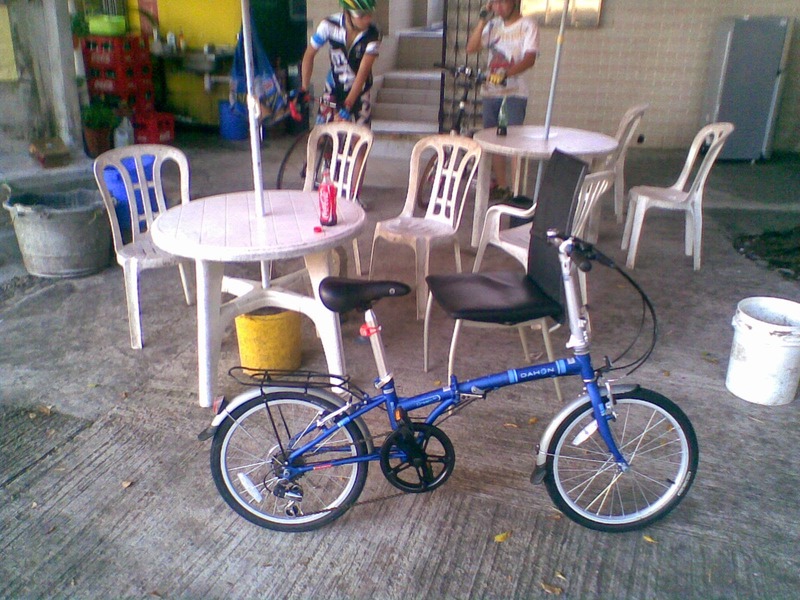 Now there's the true Hong Kong spirit!. 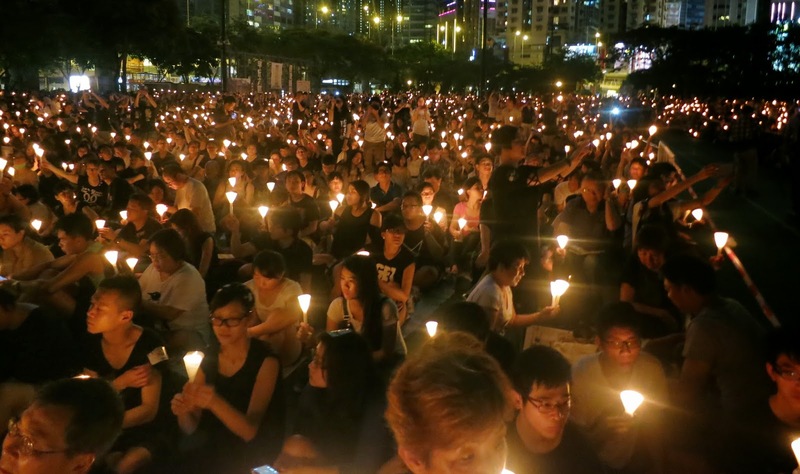 As usual, the police's estimate of the numbers attending last night's June 4th candlelight vigil was about half the organisers' figure - even though they couldn't pull their usual "at its peak" trick to underestimate the numbers this time, as the event is a static protest. Now this is one case where the real figure should be fairly easy to determine, give or take a few - since one candle is given out to each arriving participant, one only needs to count how many candles were handed out. Number of candles in box x (number of boxes purchased - number of boxes left) - simple. I didn't personally see the Voice of Lying to Hong Kong's counter-event last night, but according to the Morning Post it attracted all of a record 20 participants. The Post page includes a video of them, in which their leader tries to justify the massacre (let's call it what it was, not the currently politically correct euphemism "crackdown") on the grounds of foreign interference. Another labels someone calling for the overthrow of the Chinese Communist Party a "British dog" - indicating a remarkably narrow mindset. Hong Kong really should have better mental health care for people suffering from acute paranoia. 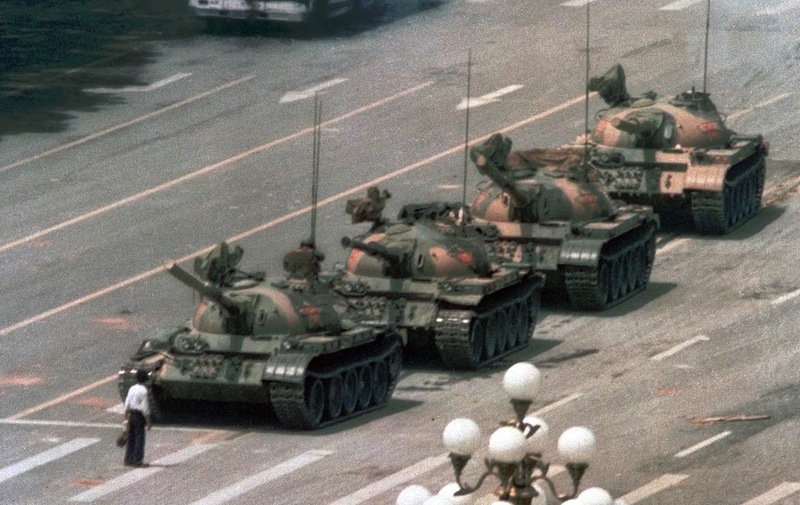 The grotesquely misnamed Beijing front organisation Voice of Loving Hong Kong not only urges us to "forgive and forget" the events of 4 June 1989 - I wonder if they would "forgive and forget" the murder of their own children for demonstrating peacefully - but has resurrected the misleading claim that "no one was killed in Tiananmen Square". Technically this may be true - the deaths largely occurred in the nearby streets - but their intent is clearly to cast doubt on whether the massacre happened at all. Well, the Woodstock festival wasn't held in Woodstock, either, but that doesn't mean there was no festival. See you in Victoria Park tonight. I love my new toy - which I took out for a maiden voyage yesterday - but it has inadvertently given me something else to hate - the braindead pedestrians who wander aimlessly along the cycle track instead of using the adjacent footpath. Grrrr! Chief Excutive CY Leung today refuted criticism that his recent round of appointments to public bodies was a case of "jobs for the boys", pointing out that one of his highly qualified cronies appointed was in fact a girl. Seriously, look at this: Vincent Lo succeeds Marvin Cheung as Chairman of the Airport Authority for one year, at which time Jack So will take over. In the meantime Jack So remains Chairman of the Trade Development Council until mid-2015, when he will be succeeded by: (pause for fanfare) - Vincent Lo! Also popping up as a new member of the Airport Authority is that rather unpleasant character Franklin Lam, whom we thought we'd happily seen the last of when he resigned from the Executive Council after it emerged that he'd sold a couple of flats shortly before the government imposed additional stamp duty to cool the property market. 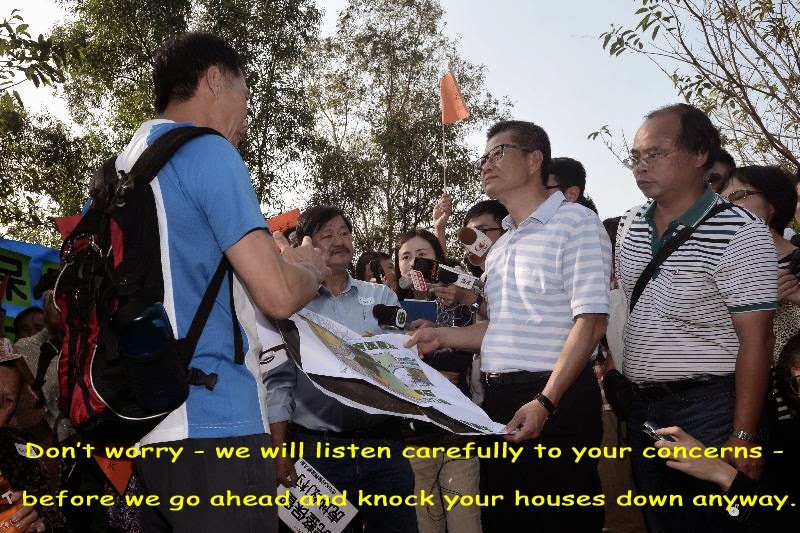 Lam is also one of the mad bunch who want to smother our country parks with concrete and encourage even more mainland tourists to flood Hong Kong. He and Lo were on the (previously) losing side of a battle with Marvin Cheung over plans to develop a new shopping mall at the airport - we can probably assume, therefore, that the new appointments reflect the government's support for constructing yet more shops selling overpriced luxury crap to yet more unwanted visitors. Meanwhile CY's campaign manager Fanny Law becomes chairwoman of the board of the Hong Kong Science and Technology Parks Corporation, while solicitor Larry Kwok, who "has been serving in many Government commissions" (in other words is another one of the boys), becomes the new Chairman of the "Independent" Police Complaints Council. Secretary for Security Lai Tung-kwok argues that the Council's professional secretariat will somehow ensure Kwok's impartiality. In a city of seven million talented people, why are appointments to public bodies so often drawn from the same incestuous little pool of (sometimes ethically-challenged) yes-men (and occasionally women)?